Winners of the prestigious award include accommodations, eateries and attractions of all sizes. 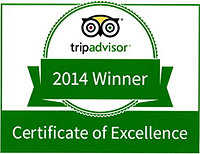 As of this year, vacation rentals are now eligible to receive the Certificate of Excellence. TripAdvisor® is the world’s largest travel site*, enabling travelers to plan and have the perfect trip. TripAdvisor offers trusted advice from real travelers and a wide variety of travel choices and planning features with seamless links to booking tools. TripAdvisor branded sites make up the largest travel community in the world, reaching nearly 260 million unique monthly visitors**, and more than 150 million reviews and opinions covering more than 4 million accommodations, restaurants and attractions. The sites operate in 39 countries worldwide, including China under daodao.com . TripAdvisor also includes TripAdvisor for Business, a dedicated division that provides the tourism industry access to millions of monthly TripAdvisor visitors. 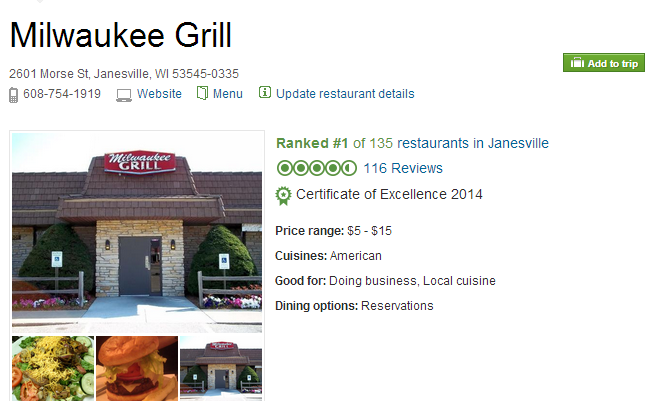 The Milwaukee Grill is a local restaurant, bar & grill in Janesville, WI with outside patio seating. Independently owned and operated for over 20 years, “the Grill” has served quality food to discerning customers who enjoy fresh approaches to classic American Cuisine. From fresh seafood, tender marinated chicken and fall-off-the-bone barbecued ribs, to a burger with more toppings than you can fit in your mouth – freshness and quality always prevail. We never take the shortcut or sacrifice quality for cost. Our staff members honestly enjoy our customers and will do their best to make your visit memorable – each time you dine with us!